1. How do I view filings/dockets/documents for a Civil, Family or Probate case? 2. How do I view dockets for a Felony, Misdemeanor, or Traffic case? 3. Does the filer need to know the UCN (Uniform Case Number)? 4. What is a Required Information Sheet? 5. What documents must be eFiled in accordance with SC 11-399 for the Clerk’s Office of Miami-Dade County? 6. Can I file Small Claims cases through the ePortal? In order to gain access to view civil, probate, and family case dockets, documents, and information, please click Miami-Dade County Civil, Family and Probate Courts Online System. Online access to dockets, recorded documentation, and information can be obtained on the Clerk’s Office website https://www2.miami-dadeclerk.com/cjis/. No, the filer will only need the local case number then select the Court Type and the system will build the state case number (UCN). The Required Information Sheet is mandatory for Family Division filings regarding annulments, dissolution of marriage, and dissolution of marriage with children. Each case within a “block” will require a “Small Claims Batch Cover Sheet” document to be submitted. 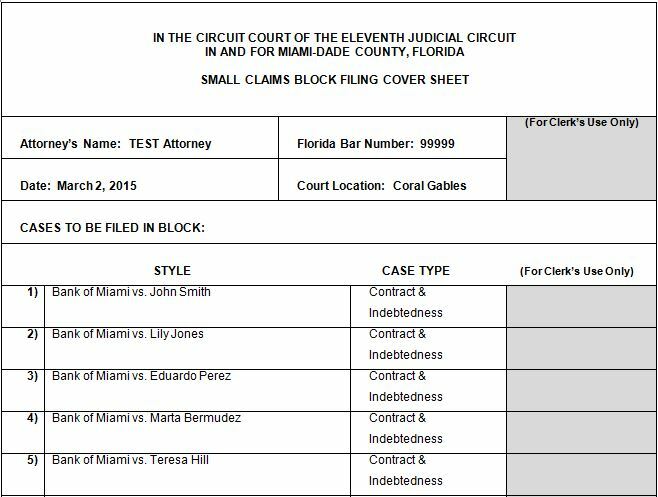 This cover sheet will allow the attorney to identify which cases will be filed in a block. The attorney must specify the style and type of each case in the block (see Figure 2.) The “Small Claims Batch Cover Sheet” form and Statements of Claim forms can be found on the Civil Court Services page in the list of Civil Court Forms. Figure 2. Example of a “Small Claims Batch Cover Sheet”. A “Small Claims Batch Cover Sheet” is required to be saved on each case submitted as a “Small Claims (Block Filings)” case type. The Clerk’s Office will process the Small Claims cases in the order that they appear on the “Small Claims Batch Cover Sheet”. If a case submitted through the eFiling Portal as “Small Claims (Block Filings)” does not match the case style of a case on the corresponding “Small Claims Batch Cover Sheet”, the submitted case will be treated as a single-filed Small Claims case. All cases listed on the “Small Claims Batch Cover Sheet” should be submitted in the same sequence to ensure that the Clerk’s office will process the cases as expected. The Clerk’s office will not be responsible if cases cannot be processed as a block filing within the ePortal.